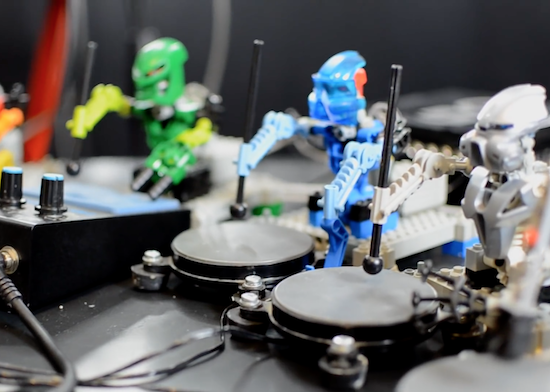 By now, you are probably familiar with the Toa Mata Band–the world’s first LEGO robotic band controlled by Arduino Uno, which is hooked up to a MIDI sequencer. Now a few years since Toa Mata Band’s debut, Italian producer Giuseppe Acito has shared the group’s latest music video: a cover of Kraftwerk’s “The Robots.” As you can see below, Acito himself performs the 1978 track’s vocals while the LEGO Bionicle figures play the tunes using a variety of gadgets, including pocket synths, drum pads, xylophone keys, and iPhones running apps. This is my inspiration to this Kraftwerk ‘s tribute, regarding their vision of the future and to their brilliant approaching to the music with a touch of irony that even now is still influencing a thousand of music producers around the world. My video contribution from Toa Mata Band (a tiny orchestra of Lego robots driven by Arduino) represents a version of the iconic tune “The Robots” using nowadays open-source technologies, microcontrollers, 3D printer, robot arm, music DAW, smarthphones, pocket synthesizers and more… trying to give a new way to read the message we got from them 40 years ago.